What is Refine Medium Project? Refine Medium is a decentralised media platform rendering authentic and high quality video content. 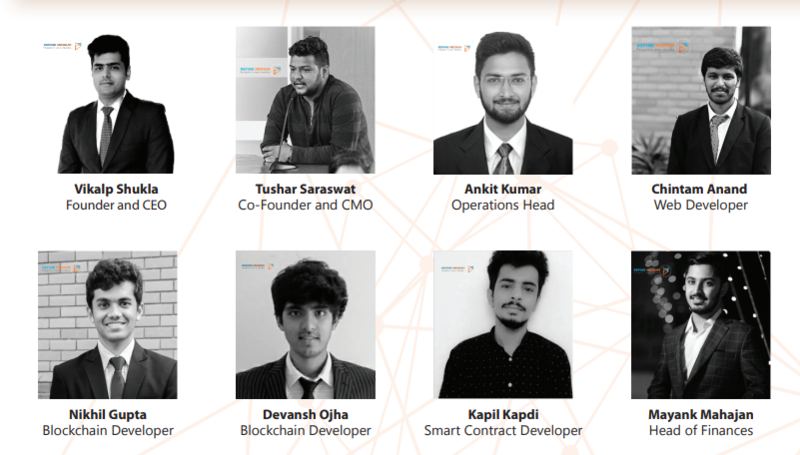 It is built on top of Ethereum blockchain designed to enable viewers, creators and innovators of the platform to connect via blockchain based smart contracts. 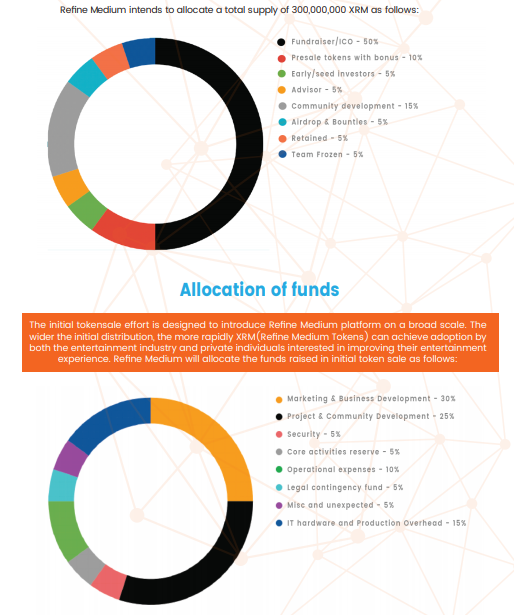 A one-of-its-kind platform that will incentivise each and every stakeholder for their contribution to the platform. 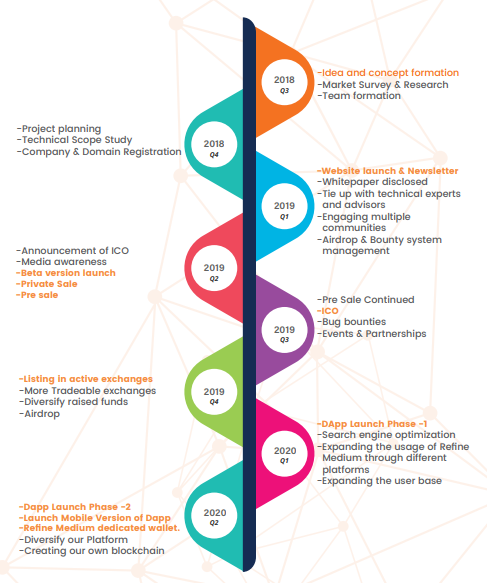 Refine Medium is constantly working with assiduousness, perseverance and diligence to achieve the immediate mission, at the same time, working on a roadmap for a vigorous future through state-of-art technological breakthroughs and with a desire to be a mandarine in online video industry. Thus, providing an impetus to ultimate user experience and satisfaction through online video industry. “The RefineRhombus” sets us apart from other video platforms who are just focussed on pocketing user money. Refine Medium raises the bar to a whole new level when it comes to social responsibilities towards the people, as humanity thrives forever. One should aim to inspire others through the content they upload on the Refine Medium platform. The platform helps in the self-actualization process with incessant support for the creator and acts as a source for them to inspire the masses. 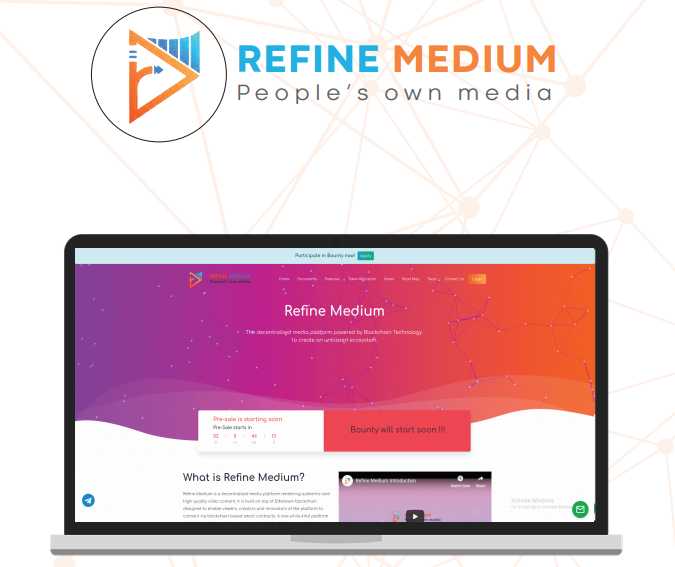 Therefore, Refine Medium has come up with a social video platform which aims to bridge the gap between “human being” & “being human” and intends to encourage the creators to “progress upwards in the Refine Rhombus.” All returns from the initial token sale will be used up by Refine Medium to continue building the platform, amplify its ecosystem and fund its incentive instruments. Refine Medium aims to assist people, particularly those who are at the bottom of the Refine “Need-Purpose” Rhombus, to make better decisions and improve their livelihood. The global audio and video traffic combined is expected to reach 82% of all internet traffic by 2018. The market volume of Entertainment and Media industry was about $1.5 trillion in 2013 and is expected to surpass $2 trillion by 2019. In 2018, global digital revenues account for a staggering 50.8% of the E&M industry income. At the same time, traditional television is stagnating and its percentage in terms of revenue generation in the industry is incessantly plummeting. Establishing P2P network that elminates intermediaries making the video uploading easy to interpret & fast. The video uploading mechanism is secured by blockchain technology which provides varying levels of privacy. The basic motto of refine medium is to build burst in blockchain technology. User data is distributed across the various nodes all around the world which makes it very hard to be exploited. Refine Medium enables its customers to monitor the data held about them & control how it is used. Making available the right content to the right user at right time across the globe. Refine Medium content discovery & suggestion algorithm will be a real time feed back loop which follows both the user and the content thus, tailoring the respective videos to the users. Ensuring equal revenue distribution among all the stakeholders of the platform. Refine Medium aims to elminate the oligopolistic behaviour existing in video platforms of today. A moderator will be democratically elected from the user base of Refine Medium platform. The main purpose of a moderator will be to address content suitability,accessibility plagiarism & legal ascepts. In other words, a group of moderators will govern the internal mechanism of the Refine Medium platform. Refine Medium replaces the “copyright agents” of today with “copyright moderators”.Refine Medium has a robust copyright query and counter-query mechanism which involves all the parties in case of a dispute. Refine Medium has a comprehensive smart contract for its Initial Token Offering and the Decentralised App. The smart contract for the token, ICO and Dapp are all inter-related and work in harmony. Unlike any other ICO, Refine Medium has a very attractive referral system which rewards the investors a percentage of investment made by the investors they refer. 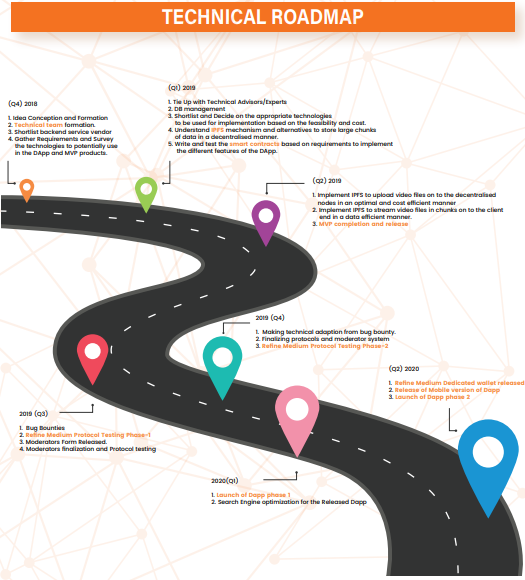 The payout here is instantaneous which means as soon as the investor sends ether to our smart contract, the reward for referee is distributed in the same transaction and all of this will be visible in the respective blockchain explorers(etherscan.io) in order to maintain 100 % transparency. Not only this, the referral system is stretched upto two levels. Let us try to understand this with the help of an example, say user A refers user B and user B refers user C. In this case if user B invests 10 ether, user A will get 1 ether as a reward (10 %) and if user C invests 10 ether, user B and user A both will get 1 ether each as reward instantly. This provides an earning opportunity for investment pools and users with contacts in the crypto industry. Therefore, if any of our affiliates bring us a whale who invests a million USD in our project, the affiliate gets 100,000 USD as a reward in ETH. In order to maintain the value over long term we have token burn functionality embedded in our contract. We will announce our token burn parties time to time and all the unused tokens will be burned making sure that the value of our token goes up and up in long term. The smart contract has been engineered in a way that it will be integrated in the DApp too. On liking, uploading and sharing the videos over our DApp, Refine Medium tokens will be rewarded to the user from the smart contract. In case the platform runs out of tokens in future, the smart contract will automatically generate new tokens (upto 300m in addition to the premined 300m tokens) and use these tokens to maintain the economy. During nascent stages of our ICO, we will not be transferring tokens to the users, in order to prevent dumping of tokens during the initial days of listing on exchanges. The tokens of team and seed investors will also be locked for a certain time duration for the same reason. This locking mechanism has been taken care of by the Refine Medium smart contract itself. Refine Medium smart contract has a dynamic pricing system in which the price changes every second linearly. We will have multiple rounds of ICO (presale, main sale, airdrop period) with different number of tokens allocated and different initial and final prices. In order to match with the fluctuating price of ethereum, we have parameterized price factor in the smart contract which helps us change the price of token during ICO on the fly. People’s own media REFINE MEDIUM Refine Medium Bounty tokens will be issued in order to fortify user adoption, thus, promoting the growth and development of the platform. Refine Medium Bounty tokens will be awarded for creating awareness about the platform till the end of our ICO through our Bounty Program. Refine Medium Bounty tokens will be swapped for 1:1 ratio for Refine Medium “XRM” utility tokens post our ICO.